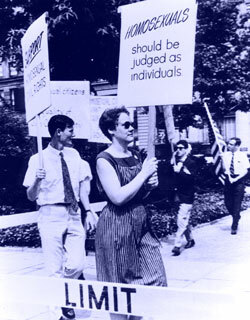 Barbara Gittings is widely regarded as the mother of the LGBT civil rights movement. Although Gittings lived in Philadelphia, in 1958 she started the New York chapter of the Daughters of Bilitis (DOB). Founded in San Francisco, the DOB was the first lesbian civil rights organization in the United States. From 1963 to 1966, Gittings was the editor of the DOB’s publication, The Ladder, the first national lesbian magazine. With fellow organizer Frank Kameny, Gittings helped enlist activists from New York, Washington, D.C., and Philadelphia for the first public demonstrations for gay and lesbian equality. Held in front of Independence Hall each Fourth of July from 1965 to 1969, the protests known as Annual Reminders paved the way for the Stonewall riot in 1969. At the 1965 Annual Reminder, 40 brave, openly gay picketers carried signs demanding equality. By 1969 their numbers had more than tripled. After 1969, Kameny, Gittings and others suspended the Annual Reminders to marshal support for a 1970 march commemorating the first anniversary of Stonewall. Proceeding from Greenwich Village to Central Park, it is remembered as the first New York City Pride Parade. During this period, feminism was flourishing. Caught in the middle, lesbians encountered discrimination in the women's liberation movement and misogyny in the gay rights movement. By the 1970s, tensions between lesbians and gay men were high. Many lesbians favored separatism—a direction never pursued by Gittings. Gittings and her partner felt their primary oppression resulted from negative attitudes toward homosexuality, not from their status as women. They believed the struggle for gay rights would be successful only with the unified effort of both genders. Gittings and Kameny waged a multi-year campaign for the declassification of homosexuality as a mental disorder. In 1970 the Gay Liberation Front and Gay Activists Alliance demonstrated at the annual meeting of the American Psychiatric Association (APA). The next year, Gittings, Kameny and fellow agitators stormed the meeting and Kameny seized the microphone, demanding to be heard. For the APA’s annual meeting in 1972, Kameny and Gittings organized a panel on homosexuality. When no gay psychiatrist would serve on it openly for fear of losing his medical license and patients, Gittings recruited Dr. H. Anonymous (John E. Fryer, M.D. ), who appeared masked and using a voice modulator. Gittings, Kameny and Dr. Anonymous asserted that the disease was not homosexuality, but toxic homophobia. Consequently, the APA formed a committee to determine whether there was scientific evidence to support their conclusion. In 1973, with Gittings and Kameny present by invitation, the APA announced its removal of the classification. Kameny described it as the day “we were cured en masse by the psychiatrists.” At the time, the “cures” for homosexuality included electric shock therapy, institutionalization and lobotomy. With the APA’s retraction, the gay rights movement was no longer encumbered by the label and its consequences. Gittings also successfully crusaded to promote gay literature and eliminate discrimination in the nation's libraries. She volunteered with the Gay Task Force of the American Library Association, the first gay caucus in a professional organization. Although she was not a librarian, she soon became the group's coordinator—a position she held for 16 years. Gittings edited the Task Force's bibliography and wrote “Gays in Library Land,” a history of the group. The American Library Association awarded her a lifetime membership. Gittings appears prominently in “Gay Pioneers,” a documentary co-produced by WHYY/PBS and Equality Forum. In 2001 the Free Library of Philadelphia established the Gittings Collection of gay and lesbian materials at its Independence Branch. With over 1500 items, it is the second largest assemblage of its kind in a public library. In 2005 a Pennsylvania Historical Marker commemorating the Annual Reminders was erected across from Independence Hall to honor the contributions of Gay Pioneers Gittings, Kameny and others. In 2012 with unanimous City Council approval, Philadelphia designated a block in the heart of the city's gayborhood "Barbara Gittings Way." 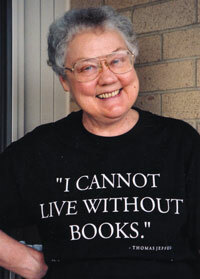 Barbara Gittings was celebrated during LGBT History Month in 2006. For more information, visit lgbtHistoryMonth.com/barbara-gittings.